If we never look beyond the world as it is, we may miss our chance to create a new and better reality. One Indiana couple had called the Hoosier state home for decades. Only recently, however, did their vision of a dream home finally come true. Boldly pursuing a new chapter of their lives with the assistance of home automation professionals from The Premier Group, the pair custom-built an exquisite 6,000 square foot home located right in Indianapolis, IN. This luxurious property is truly a work of art. It contains unique furnishings, exotic decorations, and luxurious amenities, including a state-of-the-art smart home system and in-home golf simulator. This dream home started years ago one quiet evening on the Geist Reservoir. While enjoying the state’s natural beauty, the couple was returning to their private dock after an evening on the water when they suddenly noticed the special property—just two doors away from the house they’d occupied together for years. This property’s unique and spectacular views captured their imagination, and they both felt it was the perfect location for their long-dreamed-of retirement lake home. As fate would have it, the property went into foreclosure soon after, and the couple knew they needed to quickly seize their opportunity to create a truly modern masterpiece on the water. When they purchased the foreclosed home, they tore it down to make room for their shared transformational vision. They both dreamt of a home that would offer a sharp departure—both aesthetically and functionally—from the comparatively traditional residence they had shared for so many years. They determined they’d step into this new chapter of their lives and start from scratch, updating even their furniture, kitchenware, bedding, bath décor, and beyond. To create the perfect space to share their retirement years, with total electronic and visual luxury, they realized quickly that they were going to need professional assistance. The couple brought together a team of experts to bring their vision to life—from an architectural designer to an interior designer to The Premier Group’s team of home automation experts—and tasked them with the goal to produce a modern living environment complete with a seamless whole-home automation experience. Lead architectural designer Gary Nance designed this modern home, and the construction was overseen by Dan Elliott. Interior designer Brandy Ketterer worked alongside one of the homeowners to research and obtain finishes that would add a flourish of creativity to the space. They went to great lengths to ensure that each item and object in the home was simply perfect; searching all across the United States and abroad for unique lighting, distinguished countertops, and special wall coverings. Once floor plans were solidified by the team, the next step was to flesh out home automation and the lighting design. With home automation, it’s critical for systems to be built so that they are relatively self-contained, so bringing home automation into the planning stages of a house is crucial for whole-home integration. A Control4 Smart Home system was quickly identified as the best setup for this home, given its simplicity and security. 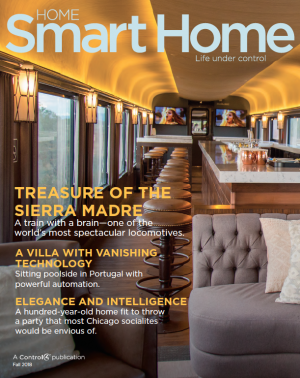 With a myriad of interface devices that make sense for the type of interaction—such as a handheld remote while watching TV, voice control while cooking, app access when on the road, and touch screens throughout the house for instant on-screen management of all of the home’s systems—Control4 proved to be the most convenient and seamless smart home option for the pair. There are also pre-set “scenes” that can be selected so when the couple is entertaining, dining, or watching the movie, they can easily produce the perfect ambiance that adjusts the lighting, audio, security, temperature, and more with the simple push of a button. Premier installed museum-quality Lucifer LED lighting fixtures in the common areas, and the lights were calibrated to interact well with the hardwood floors and the colors of the paint on the walls. Linear LEDs were used to illuminate coves, shelving, and stair treads to create an elegant evening mood within each room of the home. The lighting choices also played into Premier’s choices for the home’s central audio system. Small satellite speakers and subwoofers were placed inside the ceiling and walls to provide rich sounds that resonate beautifully in the space. The living room features a stunning 85” LG display monitor framed by customized loudspeakers and a magnificently constructed linear fireplace. The lower family room area is set up as the primary entertainment area, replete with a wet bar and easy access to an in-house golf simulator. The home security system is also a marvel of modern science and industry. There are 19 security cameras installed outside of the property, and there are four cameras placed discretely within the common areas of the interior. The home also makes use of a Honeywell Vista Alarm (also tied into Control4), which features a glass-break detector, pet-immune motion detection, and door contacts. There are also carbon monoxide monitors installed near the bedrooms. This passion was noticed and appreciated by the homeowners. “Premier's team was extremely knowledgeable and forthcoming with ideas as we described the way that we live and how we expected things to function and operate. They brought a wealth of experience that gave us the trust to let them do their thing,” the couple agreed. “We were initially fairly apprehensive about how all of the technology might complicate our lives but are ecstatic about the outcome and ease with which to operate it all.” By taking a leap into the unknown and trusting their team of experts, this pair were able to unlock their visionary capacity and achieve their ambition of the perfect luxury residence.